One of my favorite rugs. White is more of a cream color. Dress up a contemporary room with this dramatic wool rug. The modern botanical pattern stands out from the off-white background. The dark leafy shapes curl and flow in a swirling design. This rug has been carefully crafted in a hand-tufted weave. Its chic look will make a bold statement about your taste and personal style. This New Zealand blend wool rug could be the center of a conversation area in your living room. Placed close to a window, it could create a lovely visual transition to the beauty of the trees and flowers outside. I ordered this rug in 5x8 and 8x10 sizes. I think it's a great quality rug so far after having it several weeks, very thick and plush. However, I too received a black rug with beige designs rather than a white rug with black designs. I kept both rugs, because I did not mind too much and it's a good quality rug, however I think Overstock should correct the description to inform consumers of this color change that it appears multiple customers have been complaining about. Just be careful when ordering this rug, because it seems like there is a good chance that you will actually receive a black rug with beige designs despite the description on this site! I love this rug. Great quality and colors are true to the picture. Will soon take a bigger size. I loved the look of this rug. It looked perfect for the Breakfast at Tiffany's office I was designing. It's always a gamble buying a rug sight unseen, but the price was good so I took a chance. WOW! It's so beautiful! I was so worried and agonized over whether it would be "beige" like some people were saying. My rug is cream colored. It's not a bright white, but it looks fine with the white I have in the room. The rug had an equalizing effect on the different tones of cream and soft whites I had in the room and it made them all be friends. The end result is very posh. The rug itself is very thick and plush feeling and the carved wool detail is wonderful. I just can't say enough. A nice rug but you should get what is pictured, and in this case, you do not. 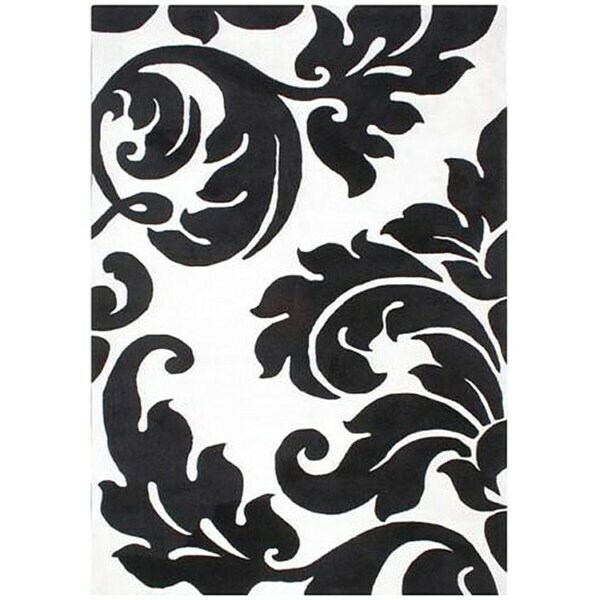 The actual rug has a BLACK BACKGROUND (not white as shown) and the swirling motif is CREAM. There is no bright white anywhere in this rug, so if that's a design element you are seeking - do not purchase this rug. Having said that, the rug is still a statement piece, bold, dramatic, a nice quality for the price point. If you can work with the reverse colors, the wow factor is certainly there. I can't believe how little I paid for this plush beautiful rug. Very good quality and colors are we represented in the photo. Would buy again. I love this rug, the picture that is shown is exactly the rug that i received and i received it within two days! yes, it sheds, but if you use a vacuum on a regular basis in your home its not going to take any extra work than usual. the wool is very soft and it just works fantastic in my room. my only debate is whether i should have purchased the larger size! plus as a frequent overstock shopping i received a **% off discount from a prior purchase that i used on this rug and the total was approx $****. i mean how can you beat that for a wool rug, after shipping? i will continue to be an overstock shopper, the products are fantastic. This is such a beautiful rug. Under my dining table. Wish there was a size between this and the 8'x10' since that one is too large but the colors are great and the design dramatic. After ordering several rugs that were not true to color and had to be returned (what a hassle), I was excited to receive a very thick plush rug that was exactly as it was described, and of extremely good quality. Delivery was very fast. I was also very pleased to note the textural difference on the rug that was not in the description but just so you know the bold design are of a much thicker LOVE IT!!! I recently purchased this rug for my living room and loved it. The black and white colors are true to the picture and am happy with it. This is a great rug that is definitely a good value and makes my living room look much cozier and more decorated. Although this carpet looks stunning and makes my room, it has not stop shedding. I have had it for almost 30 days and have to vacuum it daily. I am not sure at what point carpets stop shedding but I am sending it back. I absolutely love this rug and will purchase another one very soon. definitely a conversation starter. I love the rug. It's beautiful. Yes it does shed - keep in mind it only takes 1 minute to vacuum it and if that is too hard to do then you have bigger problems going on with yourself than the rug shedding. Overall its a great buy and would recommend to anyone looking to decorate with black and white colors! Like a few others have mentioned, this rug sheds like crazy, so I have to vacuum it all the time. The rug provides a great look for the price though. This is in a very posh office I work out of, it adds just the right amount of moderness to the space, the white is more cream than stark white, but it works for this rug. The black is beautiful and almost appears like velvet although it's not. The rug is heavy, thick and worth the money I paid. I would purchase again! I love this wow factor rug and have received so many compliments. The quality is good and colors are true to the picture. The only draw back is that it does shed. I’m glad I didn’t let that stop me from ordering it. It’s beautiful and completes my room! I've recommended this rug to a few of my friends. This rug looks great in person but sheds like crazy. I find that I have to constantly vacuum and swiffer around it. I would put this in a low traffic room. It is exactly as pictured. This rug is absolutely gorgeous. I'm glad I read other people's reviews before purchasing it, because it DOES look a little bit more cream-colored rather than bright white. Not too yellowish, just a soft cream. Edit: sheds like crazy!!! I have to vacuum it like twice a week. Makes it look dirty and like a dog rolled all over it. Too bad. However, I think it looks much better with my beige sofas and dark-wood furniture. I love the quality of the rug, I'm definitely very happy with it. I gave it 4 stars because the delivery took forever. I ordered it the same night as some other stuff, and the furniture arrived 2-3 days later (which was amazing), but the rug took quite a while... I was beginning to worry it wouldn't show up. The rugs by Alliyah are of great quality! I purchased this rug a second time after my dog ruined the first one. The black and ivory are just stunning together and the design is very modern looking! I am considering buying this design in other colors choices from Overstock because it is just such a great value! I love this rug!! It looks great in my office. It is of great quality. The only negative is it sheds a lot, but still a great purchase. More of a cream and black color than black and white. I bought this rug a while back. It was the first time I ever bought anything online. I placed it under the lower ed of the bed when I redid the rooom in gray, black and white. It turned out comfortable, cozy andsophicated. I love this rug so much! It is thick and gorgeous, and the price is really good. The quality is very good. Love this rug- sheds a little so you have to vacuum often! The color scheme compliments my living room. I have been searching for a black and white rug for sometime. I like the way this one looks and I hope it goes well in my living room. "What is the thickness of this rug?"